A Book About Death is an exhibition about to be held in New York of artist postcards, of which I’m a part. They’ve just put up a wall of images for those who wish to view it a different way than their blog. Check it out! Otherwise, my image can be found on their blog here. with some of Sadie’s chutney. And lo, I felt that it is good chutney. And this was out a window of an empty house and I thought there was something wordlessly beautiful about it. 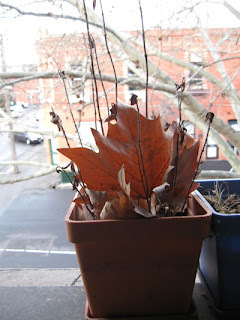 A pot that can grow sticks and autumn leaves is a pretty wonderful pot.